It is always a good idea to do routine maintenance checks around the house, especially before a harsh season approach. One of these home appliances should definitely be your air conditioner(s). through routine maintenance of the air conditioner you will save yourself any trouble during the intense summer weather and also prevent your energy bills from talking a hit. A maintained air conditioner runs efficiently, utilizes less energy, and costs lesser money. A lot of the central air conditioners have two parts: the outdoor unit and the indoor unit. The outdoor unit is the compressor or the condenser that sits next to your home and the indoor unit is the one that is located in the central duct that is by the furnace. The indoor unit will be in the air handler if you have a heat pump instead of the furnace. Keep the fins of the ac unit by vacuuming it with a soft-bristle brush. These brusghes are fragile and can be easily bent or crushed. In some of the unit, you will have to unscrew and lift the metal box so as to get near them. The concrete pads present in below the air conditioner and the heat exchanger are known to settle as the years pass. You will need to check on these when the pads continue to sink and pull the lines tight, or if you notice water puddling around the unit. These allow you to set the temperature for the different time levels during the day, and also change the temperature according to the weather, which helps you save on energy bills. If there is a room that is still hotter than the rest then you can add a duct or vent booster fan. The in-line duct booster will fit inside the duct of the room. Mount the fan near the outlet which will kick on when the cooling system runs. If your compressor is making a noise then contact the air conditioner’s manufacturer and get sound blanket. You can also buy a universal blanket of which the installation is easy. You can realign fins that have been bent or crushed by adding gentle pressure via a dinner knife. Do not insert the knife more than ½ inch inside. You have a clogged condensate drain tube if you see water gathering around the furnace when the ac runs. The air conditioning coils contain bacteria that form slime and clog the condensate pan drain tube. To change a dirty filter, turn off the power to the furnace and pull out the filter to look for dirt buildup. Is your ac the right size? Air conditioners are made after being carefully sized to the amount of the cubic feet of the housethey need to cool. If you buy the air conditioner smaller than your place needs then it willhave to work too hard and will wear out much more quickly. With a whole house fan an attic mounted fan pushes hot air out through the vents and then draws in cool outside air via open doors and windows. Allows to purge out a lot of hot air in the house quickly. Keep your windows closed, or covered with blinds, if you wish to prevent too much heat from entering your home, especially those facing the sun directly. 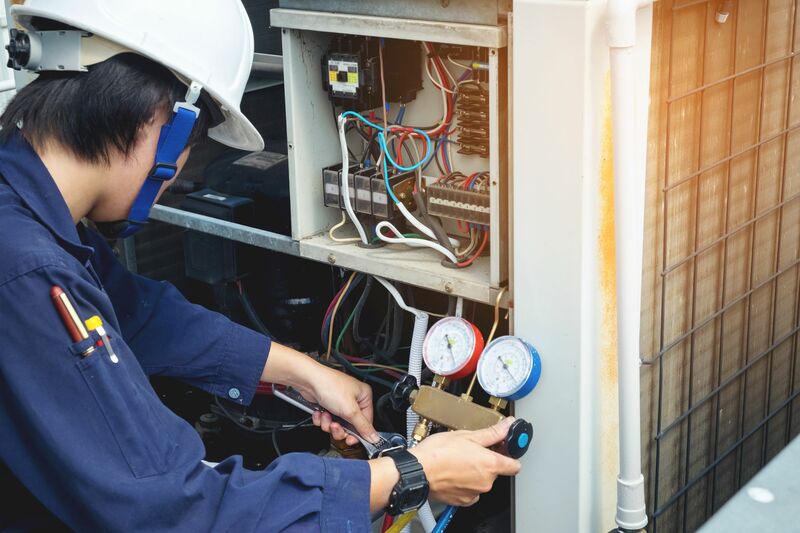 If you are comfortable working around electricity and have the adequate tools for it, then you can try fixing the smaller ac issues yourself rather than spending 100s on the repairman. Replace the unit’s damaged or rotted insulation around the outdoor lines of the ac to improve efficiency. You can scrub dirt off of the small room air conditioner with plastic bristle brush and a foam cleanser. Make sure to plan for proper arrangements of old air conditioner disposal. Follow the rules and call your local waste management organization to dispose of the ac unit. Install an air conditioner in your garage to keep it cool during the winter. To find out if there are any air leaks in your home turn off all the cooling devices, shut the furnace, close all the windows, light incense and walk around the house slowly. If the smoke is blow away from something or being sucked toward something, then it means that there is amn air leak. Cover your air conditioner condenser with weighted plywood for the next summer, to keep it protected. The outside of the air conditioner can easily become covered with dirt, grime, and grass clippings. Turn off the system and gently wash it with a water hose keeping it at a 45-degree angle.